There’s something about milestones that get people thinking. And thanking. There’s nothing inherently different this week than any other week, except that now I’ve been writing Cooking Up Romance for a full year as of May 10th. Oh, and I’m doing a giveaway this week to say thanks for reading! Scroll down for that. I never imagined how readily and warmly I’d be accepted into this weird little community we call Romland. But right from the beginning, writers Shari Slade, Alexandra Haughton and Amy Jo Cousins befriended my little egg self on Twitter with zero followers and zero clue. Since then I’ve started beta reading for Shari (which is literally the best thing about this whole blogger-reviewer business), bonded over musical theater with Lexi and spent many happy Thursday evenings rewatching West Wing with Amy Jo and my #westwingclub buddies. I’ve become fast friends with reviewers Maria Rose and Ana Coqui, sharing the ups and downs of life, of good books and bad ones. You gals keep me (reasonably) sane. Writers Emma Barry and Amber Belldene have been invaluable in beta reading the essays and guest posts I’ve written over the past year, pointing out flaws in my logic and writing and alerting me to on-coming cliffs to avoid. And Megan Mulry for always making me feel like I have something to say that matters. Seeing a photo of Sarah Frantz Lyons’ beautiful tattoos on Twitter brought me her profound wisdom and intelligence. This year would have been a much sadder one without her friendship, not the least because that acquaintance brought me a newfound love of queer romance. And shortly thereafter Alexis Hall, whose books and whose insights on the romances we read together for AAR have enriched my soul. And sometimes left me laughing in a heap on the floor. And finally, Bree Bridges, who brought me Dragon Age. Nuff said. I’ve also discovered buckets full of new-to-me writers over the past year–most notably Delphine Dryden, Carolyn Crane, Rose Lerner, KJ Charles and Jeffe Kennedy–whose very different, but brilliant romances remind me of the enormous potential of this genre every time I pick one up. Also fun has been the guest posts I’ve both been invited to write and foisted upon people. I did a post for Wonkomance, one of my very favorite romance blogs. I’ve guest posted several times with Alexis on All About Romance, an amazingly long-lived and positive community of romance lovers, bloggers and commenters that continues to be my go-to place for reviews and best-of lists of every kind of romance. I wrote about February’s Popular Romance conference at the Library of Congress for Romance Novels for Feminists, the blog that got me into blogging in the first place, which then got picked up on Teach Me Tonight, the blog for popular romance academics, which still feels like a crazy huge honor because those people are just so darn smart. And I got to do a Valentine’s Day menu for the Romantic Times website, which still kinda makes my eyes bug out of my head. None of this would be possible of course without my husband, who puts up with my annoying extroverted-thinker tendencies when I have to tease out a particular post, Chipotle runs when I’ve got a book I absolutely must finish or when it gets too dark to take photos of whatever I had intended to serve for dinner and the occasional repeat of a meal three days in a row while I refine my recipes. Oh, and his coworkers, who eat all the baked goods so I don’t have to. I love you, darling. And sorry, yes, we’re having salmon again tonight. Last, but not least, it brings me such joy to see people pick up the books I’ve recommended and try the recipes I’ve invented. Your tweets and comments are what keeps this fun for me. So all my thanks to readers new and old.And to show just how much I like all of you, I’m giving away a $50 Amazon gift card. This giveaway is available worldwide and can be transmuted to a giftcard to the ebook retailer of your choice, which I’ll work out with the winner, to be chosen at random at 11:59 pm EDT on May 18th, which gives you a whole week to enter! 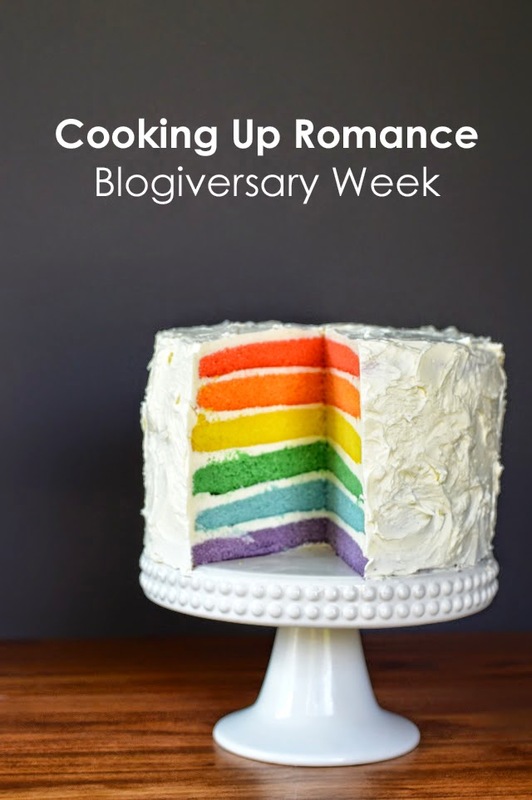 Cake photo above from this post about Queer Romance Month. Congratulations on being in "business" for a year! It's been a pleasure chatting with you on Twitter. Here's to many more years of blogging for you! happiest of blogiversaries to you! Talking about romance with you is one of the highlights of my month. Congratulations on your hard work and milestone! Congratulations to the Blogiversary ! Thanks very much! It does feel like something of an accomplishment! Thanks, Ana! I'm very much looking forward to finally meeting you at RWA. It's going to be a blast, I'm certain. And happy blogiversary to you too! TWO YEARS! Thanks! It's been a fun ride, for sure. Looking forward to hopefully meeting you at RWA! Blogiversaries are so much fun! I hope you celebrate all your hard work! I'm delighted with your acquaintance too Elisabeth 🙂 And I very much enjoy your musings and your recipes. Congratulations on your lovely blog and here's to many more years. Happy anniversary and thankyou for the giveaway. Happy anniversary! Thanks for the giveaway, always fun! Congratulations! What great recipes and book recommendations! My pleasure and good luck! Thanks Maria 🙂 And best of luck with your new blogging endeavor! I hope it stays fun! Happy Blogiversary! Thank you for the giveaway. Congrats on the Blogiversary! I love that picture of the rainbow cake! Would love to win this! Happy Anniversary! Happy blogiversary and thank you for the contest! Yay for your first year!! thanks for the chance to win. Oh god, I'm so far behind. But thank you thank you thank you for befriending me, taking me in when I limped through your neck of the woods (back again in August! ), and for helping me through a really dark time. It's a pleasure and an honor and a privilege to know you. *hugs* and happy blogiversary!